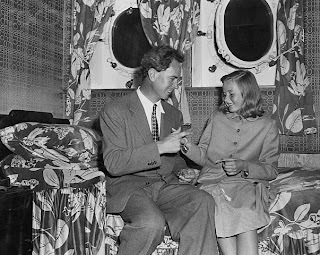 On this day in 1951, young Pia Lindstrom [shown here in a stateroom with her father, Dr. Petter Lindstrom] was on her way to Europe aboard the RMS Queen Mary to meet her mother, Ingrid Bergman, in Sweden. When Ingrid's affair with Roberto Rossellini while shooting Stromboli in Italy the previous year produced a son, she was denounced on the floor of the United States Senate; a floor vote made her "persona non grata" in the U.S., which led to her self-exile in Europe and her eventual divorce from Lindstrom. In 1952, two years after she married Rossellini, Bergman gave birth to twins, Isotta and Isabella Rossellini.